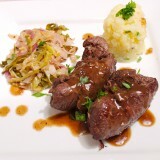 Straight from the island of Corfu a recipe for beef fillets in a garlic, parsley and vinegar sauce. Yes, it’s the famous Sofrito! Corfu is a beautiful island between Greece and Italy and is a popular destination for tourists around the world. I have been there a few times and I was impressed with the deep blue sea and its gorgeous beaches. Gastronomically speaking, the island has so many local dishes to offer to the hungry visitor. I am not talking about pizza, pasta and burgers that many tourists are seeking in any other place they go. 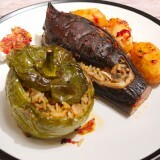 I am talking about the traditional dishes that the locals have developed and mastered during the last few centuries. Where should I start with Corfu? “Pastitsada” is a must-try dish, with a rooster being slowly-cooked in tomato sauce and served with local pasta. I promise I will make it at some point and share it with you. Sofrito is my favourite! I am basically attracted by its simplicity and the few ingredients that you need to cook an epic dish. 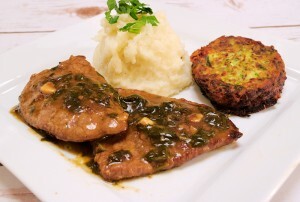 It’s just beef fillets slowly cooked in a garlic-parsley-vinegar sauce. The result: unbelievable! 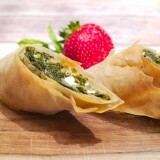 Sofrito sounds Italian and actually it means “almost fried”. That’s what you are actually doing. 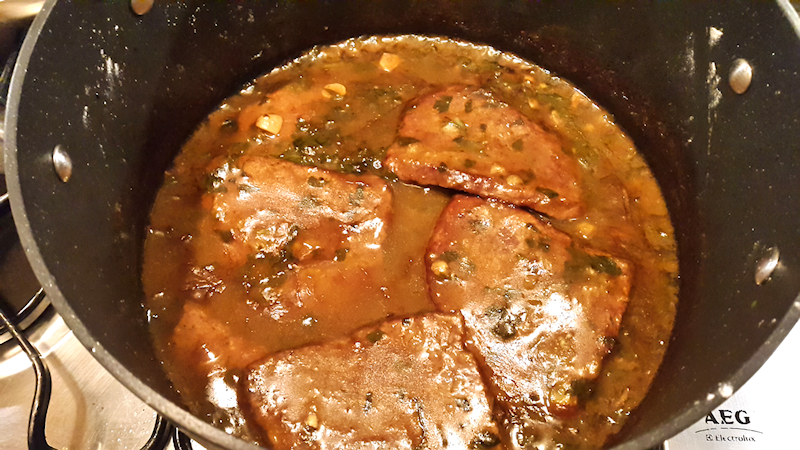 You fry the beef slightly and then you let it cook slowly with the gorgeous sauce. In principle, Sofrito is made with veal fillets and not beef. 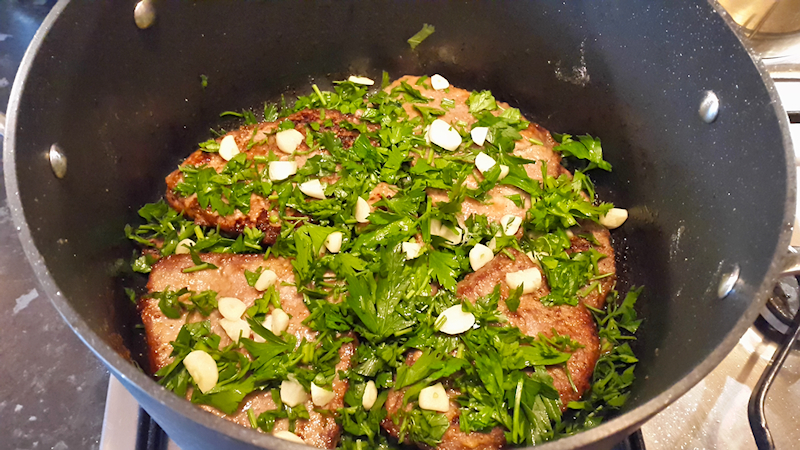 Veal is more tender when its cooked slowly and Greeks are not big beef eaters. 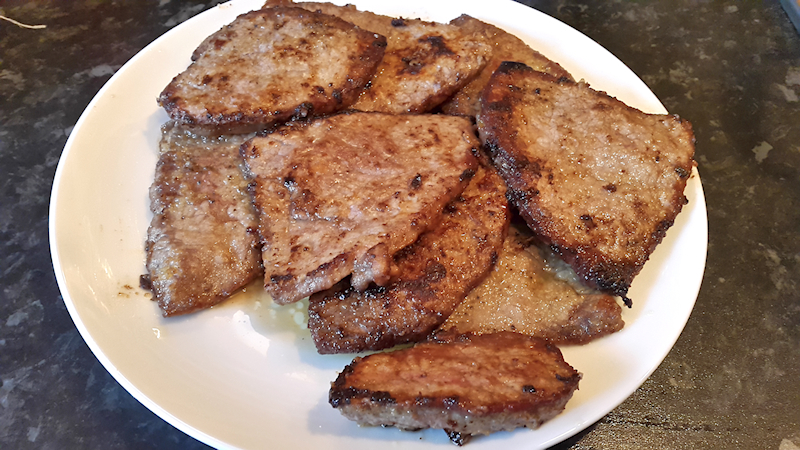 Unfortunately, I couldn’t find veal steaks where I live and had to rely on nice beef fillets. It worked great! Don’t be scared to use as much garlic as you like. I propose 5-6 cloves but the people of Corfu may use much more, maybe over 10. As it cooks, the garlic gets a nice and sweet taste that blends nicely with the parsley and vinegar. P.S. I made some zucchini fritters to serve the Sofrito with. I basically used the mixture for the zucchini cupcakes and fried it in some sunflower oil. Simple! 1 kg (35 oz) beef fillets cut ~ 1 cm (1/3 inch) thick. 5-6 garlic cloves coarsely sliced. A big bunch of flat-leaf parsley coarsely chopped. ¼ cup of white wine vinegar. 1 cup of beef stock. ½ cup of extra-virgin olive oil. ½ cup of all-purpose flour. Season the fillets with salt and pepper, cover them with flour and shake it to remove the excess. In a large pot, warm up the olive oil on high heat. When the oil is hot, add one by one the fillets and fry them until they start getting golden on both sides. Remove them and set aside. 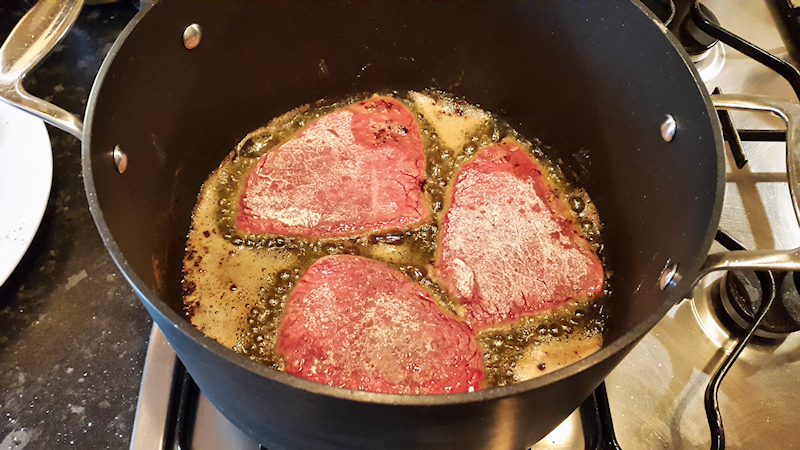 In the same pot (keep the oils and juices left from the frying) cover the bottom with one layer of fillets. Add half of the garlic and parsley. Season slightly with salt and pepper. Add another layer of fillets. Top it with the rest of the garlic and parsley. Season again with salt and pepper. Add the vinegar, wine and beef stock. The juices should cover all the layers. If not, add some water. Turn the heat to high and bring it to the boil. When it starts boiling, reduce the heat to low and let it cook slowly for ~ 1 hour. Do not stir the food while it is cooking! Just shake the pot from time to time so the bottom fillets will not stick. 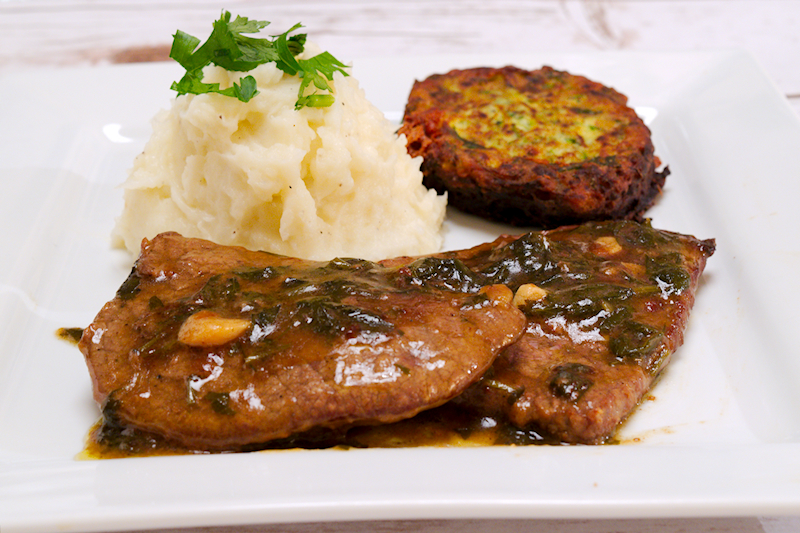 Enjoy the sofrito with rice or mashed potatoes.